← Is the Smallest Multicelled Organism an Insect? After our initial launch, we had a number of people submit questions. One of the first, from Antnommer on Twitter, I found particularly interesting because it aligns with my interest in biochemistry. @SciBugs @BioInFocus @BugQuestions What does an osmeterium smell like? Does the smell differ between species? 1.) What is an osmeterium? 2.) What does it smell like, and does the smell differ between species? 3.) What chemicals give the osmeterium it’s characteristic odor? Image credit: Left, Papilio polyxenes courtesy of Tom Murray under CC attribution via bugguide Right, Papilio multicaudatus courtesy of Mike Quinn under CC attribution via bugguide. An osmeterium is a defensive organ found on Swallowtail butterfly larvae, and is unique to the family Papilionidae. In the pictures to the left, the osmeterium is highlighted in red. It is exerted when the caterpillar is harassed by a predator, and has a pungent odor which drives the predator away. In some species with eyespots, the osmeterium completes the illusion of snake mimicry by resembling the snake’s forked tongue. It’s interesting that the osmeterium only repels insects, and doesn’t seem to make a difference when the caterpillar is attacked by a bird. What does the osmeterium smell like, and does the smell differ between species? This question is admittedly hard for me to answer, partly because it’s a little bit subjective. Also, I can only answer part of it because the only species I’ve held as a larva is Papilio polyxenes, or the black swallowtail. Most of my experiences with this species also happened when I was younger, and I haven’t encountered one in a number of years. Fortunately, many entomologists weighed in on Twitter. @SciBugs @hossiet @JayFitzsy @dllavaneras @BugQuestions @Antnommer @BioInFocus Black swallowtails smell strong; not exactly bad. Spicy! In my experience with P. polyxenes, I always remembered the larva smelling like parsley which I don’t consider unpleasant. According to Daniel Llavaneras, Battus species have an unpleasant odor, while biologist Thomas Hossie attributes a citrus-y smell to some swallowtail species. I think from this, that it’s apparent that different swallowtail caterpillars have different odors. However the smells I consider unpleasant may be different from what Daniel and Thomas consider unpleasant, so there’s a bit of difference in interpretation here. There’s another way we can tackle this, though…we can tackle this question through chemistry! What chemicals give the osmeterium it’s characteristic odor? Life, at it’s most basic level is a chemical process. Our senses of taste and smell are largely the result of receptors which sense different combinations of chemicals. Different chemical compounds have different tastes and scents. Lots of animals, including swallowtails, defend themselves with chemicals that taste and/or smell bad. Omura et. al took on this question from an ecological chemistry perspective. They analyzed the osmeterial secretions from 6 swallowtail species from the genus Papilio…or from a closely related genus. They also went a step further, and analyzed the osmeterial secretions from species in different life stages. They found results I thought were interesting. 1.) Osmeterial secretions vary within the lifespan of the caterpillar. Most swallowtails mimic bird droppings when small larvae, and grow up to mimic snakes. The changeover typically happens at the last moult; fourth instar larvae mimic poop, while fifth instars mimic snakes. The fourth instar secretions are more complex, and mainly consist of terpenoids…chemicals found in a wide variety of fruits and spices. Limonene, for example, would explain the citrusy smell Thomas Hossie described. Fifth instar secretions, on the other hand are far simpler and consist of aliphatic acids…which are similar to the compounds which give rancid butter their smell. 2.) In addition to being different at different life stages, secretions can vary widely between species. Of the 6 species, the only component the fourth instar larvae had in common was a chemical called myrcene, a major component in thyme leaves. In one species, P. demoleus, myrcene comprised .2% by weight of the osmeterial secretion. In another species, P. macilentus, the same component made up about 25% of the secretion. P. demoleus secreted only 7 components, which was by far the simplest mixture. P. paris, on the other hand, secreted a mixture of 24 different components. Between all 6 species, a total of 41 compounds were detected. The 5th instar larvae, on the other hand, had only 7 components detected between them. These 7 components varied widely as well. Methyl isobutyrate, which smells like rancid fat, varied from 4.6% of the mixture in P. polytes to 76% of the mixture in P. macilentus. Unfortunately, the authors of these papers didn’t describe the odors of the insects…which admittedly makes it difficult to connect the chemistry to a specific sensory experience. 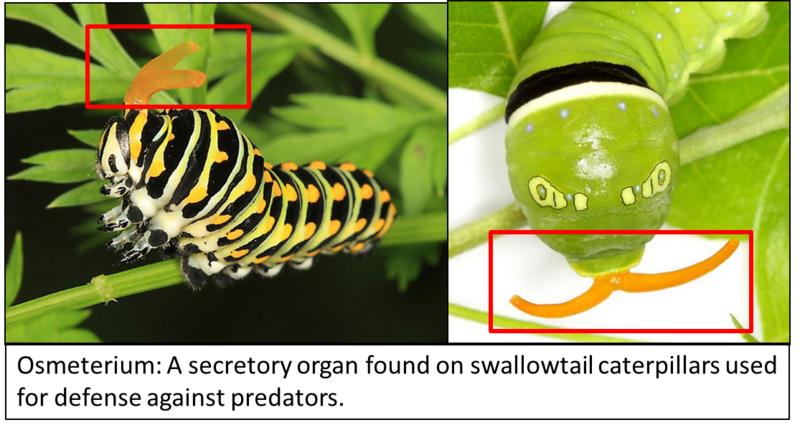 However, based on anecdotal and chemical evidence, it appears that the osmeterial odor changes both between species and within the life stages of swallowtail butterfly caterpillars. This entry was posted in Chemistry, Physiology and tagged Biochemistry, Butterflies and Moths, Chemical ecology, Lepidoptera, Osmeterium, Papilionidae. Bookmark the permalink. 8 Responses to What does an osmeterium smell like? Does the smell differ between species? Thank you so much for answering my questions! That was a really fascinating answer (as most answers are when bugs are involved). A follow-up question, if I may: do the chemicals secreted also differ depending on what the caterpillar eats? That’s an awesome question, and to be honest I don’t really know. A lot of the chemicals secreted by the younger larvae match up to those which could be found in host plants, but I didn’t read any papers which looked at the effect of diet on what they secreted. The review stated that the larvae produced all the chemicals they secreted…but there doesn’t seem to be a lot of biochemical work to back this up. I’m not sure the answer to this question is known. My boyfriend just sprayed tinactin antifungal spray on his feet and I said “the house smells like caterpillars! :D” He had no idea they had a smell, he thought I was crazy so I looked it up and found this post 🙂 Can anyone else try it and let me know if it is reminiscent of the caterpillar smell? I’ve just encountered several of the caterpillars on my lemon tree thinking they were bird poop. i nudged one with a stick and it displayed its orange colored horns and released a scent reminiscent of sweaty socks or wet towels that sour. Extremely strong and off putting. gave me a headache. My son and I just found a black swallowtail caterpillar on the hot pavement in a parking lot and moved the little guy to some shady grass nearby. I have washed my hands repeatedly and cannot remove the odour. It is a sickly sweet perfume- I can kind of get how one might be reminded of citrus, but it is also very “thick”, kind of like a musk, but different. If that is at all helpful.